Some 80% of both deep sea and river cruise passengers book via a travel agent. It is not surprising. Choosing the right package is far from easy. Big ship, small ship? From a UK port or fly to your boarding point? Lots of seaborne time, or a visit to a new setting virtually every day? And an educational holiday or a rest? With the predominance of agencies in mind one of the major events of the week (trade only) is the ACE (Association of Cruise Experts) gathering in Birmingham 20 September, aptly name Columbus Day. In 1492 the good Christopher took the world’s first cruise, from Grand Canaria to the Bahamas, a five-week enterprise. One thing the trip did have in common with today’s cruise ship – there was a doctor on board. 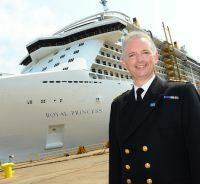 Earlier this month the float-out of the latest Royal Princess (the third and easily the biggest) took place at the Fincantieri shipyard in Italy. At 141,000 tons and 3,600 passengers she is the largest cruise ship ever built by the company. With a very sleek appearance she is likely to set new standards for cruising comfort, innovation and style in much the same way that her distinguished predecessor Grand Princess achieved in 1998. Her seven-day maiden voyage takes place from Southampton 16 June 2013 to Barcelona which will be her home until September when she crosses the Atlantic to Ft Lauderdale for a season of Caribbean cruising. Just like a stage show there will be previews, two three-day voyages expected to take place from 10 June. With Guernsey as the destination Princess will be able to test the tender arrangements! Princess today is part of the massive Carnival Group which includes Cunard and Carnival itself. It offers an essentially American product differentiating from P&O, also now owned by Carnival, whose ships are very British. It has a strong UK sales operation and for summer 2013 will base six ships in Europe using Barcelona, Copenhagen, Rome, Southampton and Venice as the main departure ports. Dover features too (but not Royal Princess – too big). The specification of the new vessel is very impressive. Just over 1,000ft long and 125ft wide she has 19 decks and 1,780 cabins of which 81% have balconies. The maximum speed is 26 knots and she will be able to squeeze through the Panama Canal when the new locks are completed, possibly in 2015. When full of children and crew 5,600 people can be accommodated. 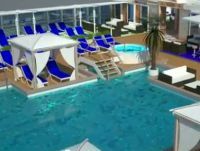 On her top decks, Royal Princess will feature a new adults-only pool surrounded by seven plush private cabanas that appear to be floating on the water. Two additional pools will flank a tropical island that will offer pool seating by day, and by night will become an outdoor dance club, complete with a dazzling water and light show. Princess’ signature adults-only haven, The Sanctuary, will be expanded both in size and amenities. The popular poolside theatre, Movies Under the Stars, will play a starring role mid-ship with an expanded size and high-definition viewing. 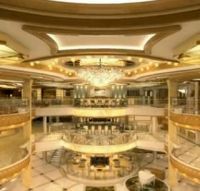 Many of Princess popular features will be retained and new ones added but once again the social hub will be the expanded atrium, half as big again as compared to previous ships, designed to enhance the lively street-café atmosphere passengers have become accustomed to on current Princess ships. With more open space for viewing live entertainment in the Piazza from decks 6 and 7, as well as venues that appear to float mid-air, this new atrium represents a prototype design that will surely catch on. Once again there are three main restaurants with Concerto and Symphony for flexible dining and in the stern The Allegro, with fixed times, offering the Chef's Table Lumiere featuring a spectacular hand-carved glass table, surrounded by a curtain of light for privacy. A rather impressive private dining area has also been added for up to 12 people. On the Lido deck the much enlarged Horizon Court Buffet will showcase an industry first, 1,100sq ft artisan pastry shop – an astounding creation with custom-built displays of amazing desserts, a full-range coffee bar and stations where pastry chefs will demonstrate candy making, cake decorating and other skills. Sabatini’s, the Tuscan-inspired specialty restaurant, has always proved popular and will feature an impressive wine tower of large bottles, including magnums and jeroboams, and a walk-through to Vines Wine Bar, perfect for pre- or post-dinner drinks. Passengers in some of the more expensive cabins can also take breakfast here, a quiet and personal location to start the day. Unique on Royal Princess is an over-water SeaWalk, a top-deck glass-bottomed enclosed walkway on the ship’s starboard side extending more than 28ft beyond the edge of the vessel. From here passengers can enjoy dramatic views, including to the sea 128ft below. On the ship’s port side, passengers will find a similarly-unique cantilevered SeaView bar, with cocktails to match the unbeatable vista.A new innovation is Princess Live, a flexible, 280-seat venue based on a television broadcast studio. Princess Live! will serve as a venue for daily broadcasts of ‘The Wake Show’ and will host a live audience. The studio will be used for a variety of events, including game shows, interactive cooking shows, art house films, enrichment classes, murder mysteries, trivia, and ‘Meet the Experts’ presentations from the crew. Additionally, Princess Live! will serve as a more intimate performance venue for onboard musicians who will offer ‘unplugged’ and ‘in-the-round’ shows, providing an opportunity for entertainers to connect with the audience in a unique environment. The adjacent Princess Live! Café will surround passengers with interactive, wall-mounted screens showing the ship's position, ports of call, points of interest and even international newspapers. The café will serve up specialty coffees, teas and freshly squeezed citrus juice, plus will offer a selection of fresh-baked croissants and pastries in the morning. Not only is the Royal Princess remarkable in its size, but the vessel is also notable for it’s “future-proof design” because it complies with the most recent regulations in shipping. The vessel was planned using a “rational use of space” ideology; with the aim of avoiding any wasted tonnage for added energy saving that would otherwise increase operating costs and harmful emissions. In fact, Fincantieri says that the ship will be able to adapt to every possible type of cruise, operating from Alaska to Australia, even in environmentally protected areas where navigation is restricted. We just had the show this. The shower within the ‘Reflection Suite’ on Celebrity Cruises’ newest ship, Celebrity Reflection. Not for those who do not like heights. Cunard and P&O have introduced what they call “greater trust and reassurance” in pricing with the introduction of new Vantage Fares backed by a Price Promise. Covering cruises departing from April 2013, the initiative leads a new long term approach to pricing by the two companies designed to give added peace of mind to holidaymakers, especially to those booking early to secure the cruise of their choice. With the new Price Promise passengers can now secure their booking knowing that if the Vantage Fare for their booked holiday were to be reduced, they would automatically receive a complimentary benefit such as on board spending money or an upgrade, to the value of any reduction in price. The new Vantage Fares include a choice from a range of benefits such as on board spending money, car parking at Southampton, return coach transfers, and airport parking. 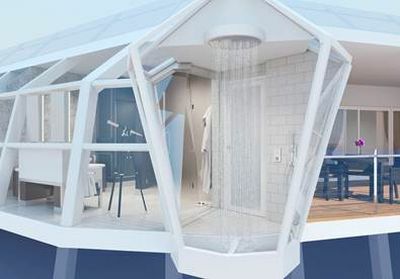 Celebrity Cruises’ new Celebrity Reflection, entering service 12 October 2012 on a nine-night European cruise from Amsterdam to Barcelona, is to feature an all-glass rain shower extending out over the edge of the ship. 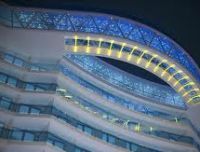 It is part of the 1,636sq ft two-bedroom Reflection Suite with its distinctive sea-view bathroom and a host of amenities including an round-the-clock European butler service. The Reflection Suite is adjacent to the brand’s five new “Signature Suites”, each offering a 441sq ft stateroom and 118sq ft veranda. 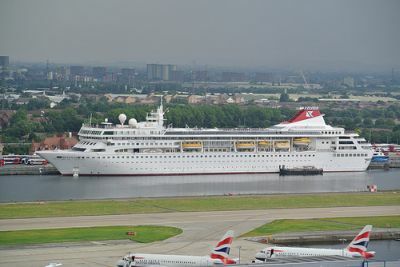 Saga Ruby, originally Cunard’s Caronia of 1973 and the last British-built cruise ship, will be retired from the Saga fleet at the beginning of 2014. Sad to reflect that since that time Fincantieri in Italy has built over 60 cruise ships and continues to churn them out (see Royal Princess above). A fine traditional ship with excellent sea manners she is now time expired but remains a firm favourite with Saga cruisers.